October is the Perfect Time to Start a New Fitness Routine! How amazing does wearing a chunky scarf and nursing a pumpkin latté while apple picking sound right about now? But here’s what people apparently don’t find as enticing this time of year; GETTING TO THE GYM!!! In fact, October marks the month with the fewest gym member check-ins! Who would think that? But fall does mark the start of football season, aka beer, barbecue, and lazy Sundays. Once your diet changes, a lot of people kind of throw in the towel! If you’ve decided that you’ve already slipped up, you could think that you might as well stay at it. And while some people snap out of their gym hiatus and head back for November and December, many others wait until resolution time in January to revisit the gym! Let’s NOT let that happen! Do you want one way to step up your gym visits this time of year? Try something new! Since it’s a transitional time anyway, transition into a new fitness routine! Try a group class you’ve never taken before or start up with a personal trainer! Maybe yoga is more up your alley, or a new place opened in your neighborhood! Whatever sounds motivating should be your new game plan! 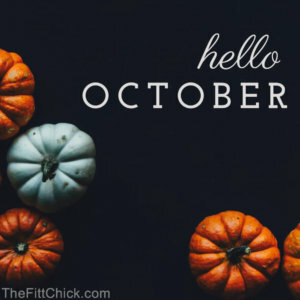 Make October the month you get inspired to make real changes that will help you see real results!  Don’t let cooler weather slow you down! The time to start is now!